We may well be approaching the time of year of apparitions and ghostly happenings, but there are times when certain brands take on a truly spectral form! Whilst it is not uncommon for a brewery to resurrect a particular brand from its portfolio, or a brewery it has taken over, there is something more macabre about a brand that is alive and kicking today, but the brewery itself - long dead! 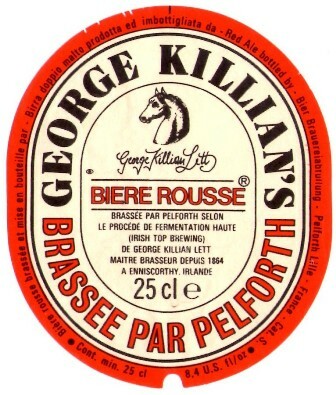 George Killian's is one of the stranger tales of survival in the brewing world and originated as a brand from George Henry Lett's brewery at Enniscorthy, in Co. Wexford, Ireland. The Royal Park brewery was founded in 1864, and one of its beers 'Enniscorthy Ruby Ale' developed a strong local following. In today's terminology 'Ruby' would describe a hue closer to port, and in the dark bitter style, and this earlier incarnation may well have been that dark. Today its descendent is described as 'red' rather than 'ruby' in the later tradition of 'Irish Red Ales'. The origins of the style are said to have been borne out of the intemperate climate of Ireland itself, with conditions unfavourable for hop production the beers have a low hop rate. The emphasis has traditionally been on producing a maltier style (with barley conveniently being a more successful crop) suited to the winter chill that drives through the southern Isles. The red hue would derive from a higher use of caramel malts in the blends adding a touch of sweet warmth to the flavour. 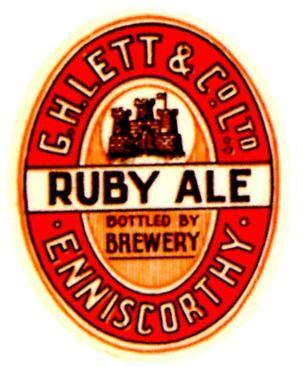 The Ruby Ale continued to be brewed at Enniscorthy until 1956 when a decision was finally made to close the brewing side of the business, and act purely as wholesalers, and the brand look set to disappear forever. A descendent of the founder however, George Killian Lett, was approached by the Pelforth Brewery in France with a view to purchasing the brand name 'George Killian' in the early 1980's. This was agreed, and the recipe for the top fermenting brew moved to Lille. With a strength of 6.5%Alc/Vol, and a bottle size of only 25cl (that gave due reverence to its strength) this was a credible imitation of the Irish red ale style - even if its production had moved across the channel to French soil! In the mid 1980's a variation of the name was once again rejuvenated to supply a completely new market - this time in America - to chime with the large emigrant population there. The Coors Brewery of Colorado purchased the rights from Pelforth to use the brand name 'Killian's Irish Red' for the US market, and although initially top fermented, the brew that is made there today uses bottom fermenting lager yeast. By its very nature this would give a beer very different characteristics, allied to the fact that the alcohol content was greatly reduced to 4.9%Alc/vol. offering a more mainstream, rather than specialists, appeal. Ironically, although the beer has made a successful channel and transatlantic crossing and found a ready market abroad, it has never been re-introduced to its native Ireland. It's history here ended the day the brewery closed its doors, never to be exhumed. The Killian brand is an example of the illusionary nature deployed by breweries within the industry, depicting a brand that is not quite what it seems, brewed far from its country of origin.